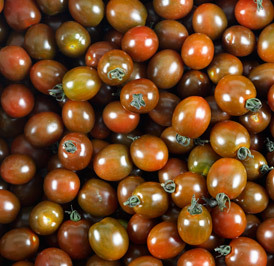 Slice the Mini-Kumato® tomatoes very thinly and arrange them on a plate like a ‘carpaccio’. Cut the melon in even thin slices as the tomato or turn small balls with a special melon scoop. Arrange the melon over the tomato carpaccio. Mix all the ingredients for the vinaigrette together en drizzle over the carpaccio. *Serve this dish natural as a starter or in combination with smoked salmon and green salad.